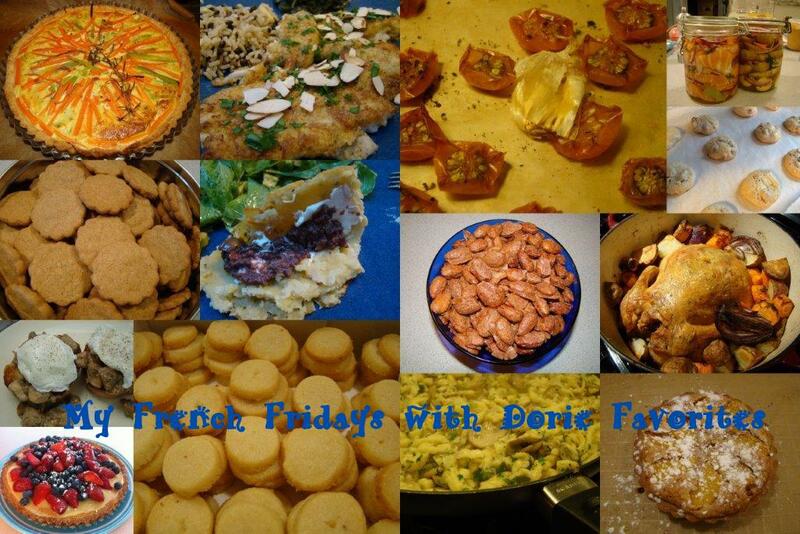 Last week marked the final recipe that the French Fridays with Dorie crowd cooked together. After over four and a half years, week by week, we hit every single recipe in Dorie Greenspan’s book Around My French Table. Before we call it quits, and to let us down easy, for the next four Fridays, we’ll reflect our experiences with the book and share some reminiscing. This week, the theme is to share our Top 5 favorite recipe(s) from Around My French Table. With over 300 recipes in the book, this is a tough choice. To help the process, I decided that to be considered, no matter how much I enjoyed the recipe, I had to have made it more than once. And both Howard and I had to enjoy it. Without that staying power, it didn’t seem fair to consider a one-hit wonder to be a favorite. 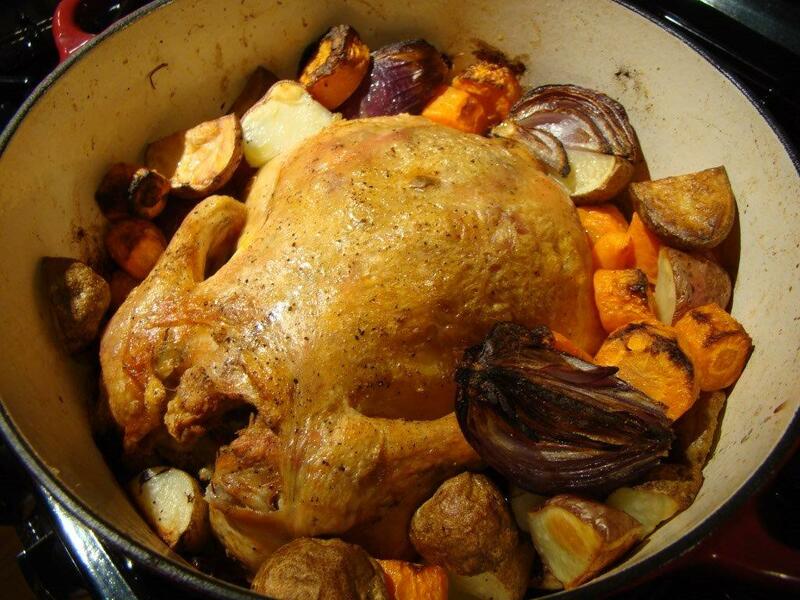 Roast Chicken for Les Paresseux: Lazy People’s Chicken is now my go-to roast chicken recipe. The chicken is always moist and flavorful and the accompanying vegetables delicious. Without a doubt, the best part is the bread raft that holds the bird up off the bottom of the pot and absorbs all the drippings. I now coat the entire bottom of the pot with bread, not limiting myself to one piece. It’s the best part. My sister Jane makes this one frequently too. She used to keep the bread to herself (chef’s treat, as Dorie says), but my niece caught on and now she has to share. Gerard’s Mustard Tart: I adore tarts. I make them frequently, playing around with the fillings and crusts. 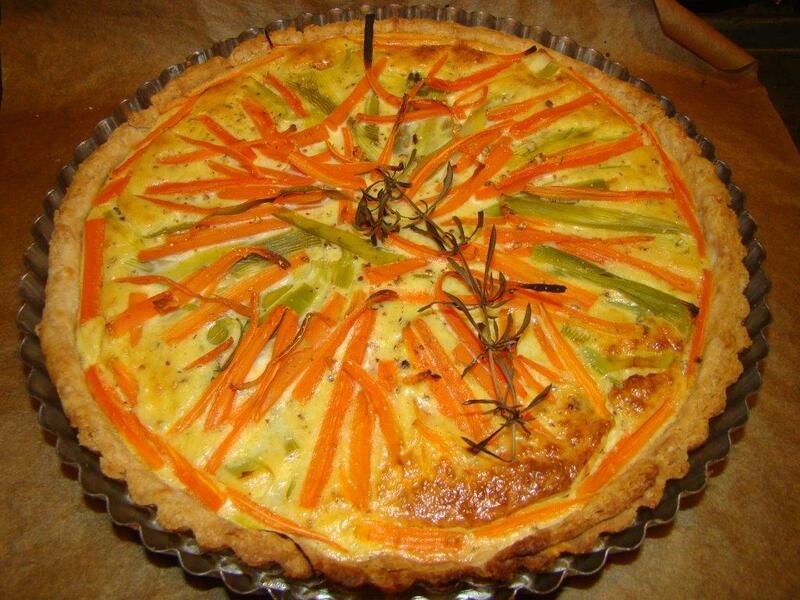 This tart is similar to a quiche, but the mustard adds a unique touch. Both the original recipe with thinly sliced carrots and leeks and the bonne idée with tomatoes are delicious. This is hands down my favorite tart in AMFT. 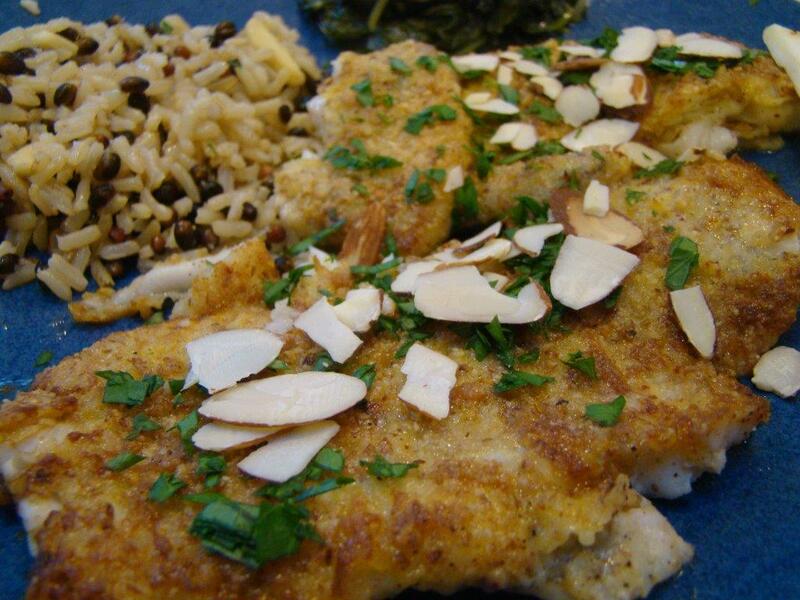 Almond Flounder Meunière: This simple method of quickly pan frying fish fillets has become a favorite. With a ground almond coating on one side and the other side left plain, this recipe combines the classic meunière and amandine preparations into one. Herb-Speckled Spaetzle: Despite the fact that I’d received a Spaetzle press as a wedding shower gift and never used it in over 20 years, I still had it stored in my basement. I supposed it was just waiting for the moment it was the FFWD selection and I tried spaetzle for the first time. 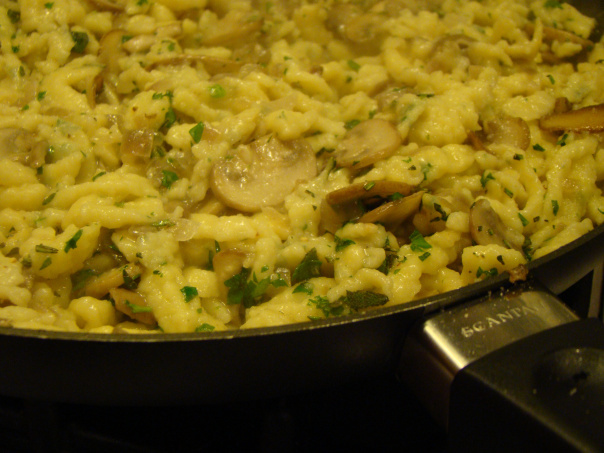 This is a favorite, oft repeated, dish now, often served to company because it turns out that lots of people I know love spaetzle. Who knew? 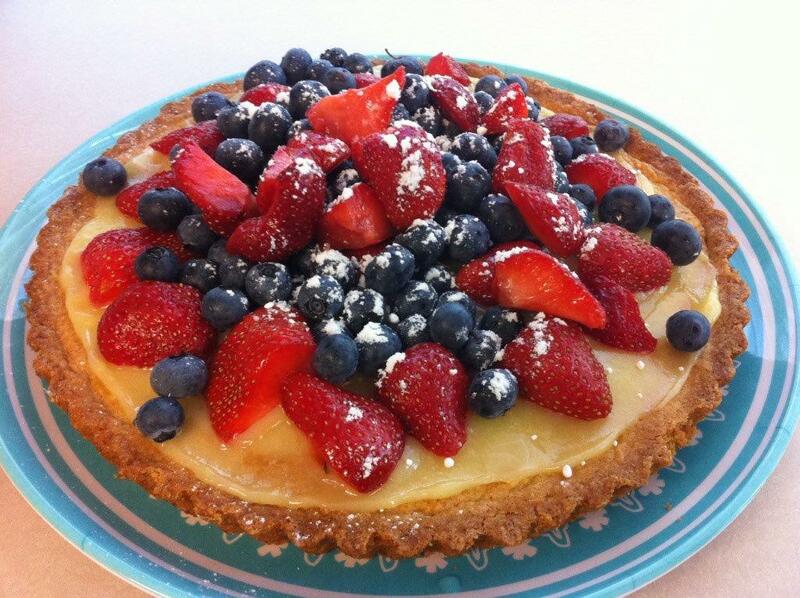 Sable Breton Galette with Berries: This is probably my favorite dessert in the book. Howard and I don’t often agree on desserts as I tend to enjoy fruit tarts while he is a chocoholic almost all the way. This crumbly base covered with lemon curd and fresh berries is a summer treat that we can both get behind. Limiting myself to just five is a challenge, so I’ll also include my “Honorable Mentions”. These are recipes I make frequently but weren’t quite the top of the top. 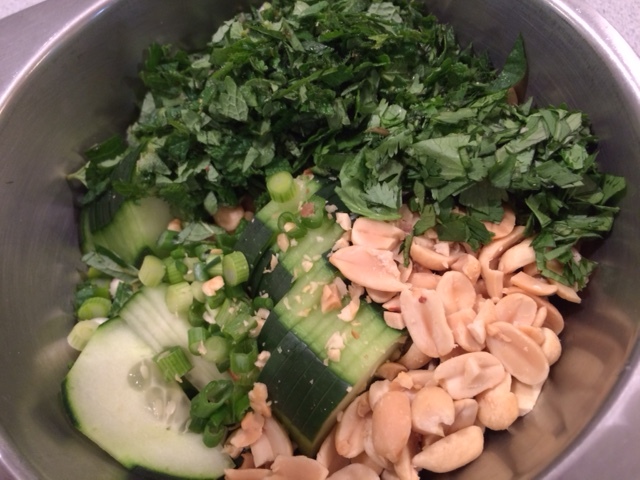 Sweet and Spicy Nuts: These are so versatile and I make them over and over. They are a great snack, a perfect hostess gift, and they’ve made several appearances into the Holiday treats packages I make each year. I seldom make them the same way twice, varying the nuts and seasonings to what I’m in the mood for. Croquants: I’ve decided this is my favorite way of using up extra egg whites. Having very few ingredients, these confections are simple to stir together and bake. They are also addictive. Cheez-it-ish Crackers: I eat very little packaged food, but one of my weaknesses is for Cheez-It crackers. The homemade version is so much better. I always use the slice-and-bake method to make it easy. I’ve made this with several different cheeses. Sometimes I keep the log round, but I’ve also squared off the sides for a more Cheez-It-like shape. These have also appeared in my holiday treats packages. Slow-Roasted Tomatoes: This has become my favorite way to preserve summer’s cherry tomatoes. 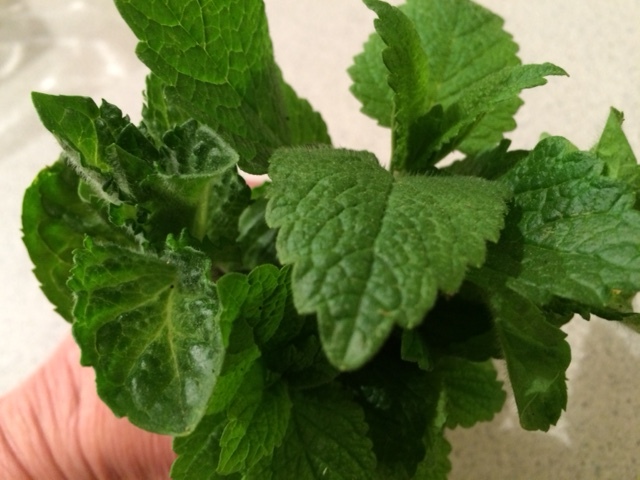 They can be used in salads, relishes, or just eaten with a spoon. They also freeze well, so you can enjoy a taste of summer on the most wintry day. There were also a handful of recipes that I wish I could consider as favorites, but, alas, I only made them once. When I page through AMFT, they always catch my eye, and I intend to make them again. It’s hard because I love to try new things, and so it’s only the most special recipes that get to be repeaters and then a stalwart part of my cooking repertoire. I still want to give a shout-out to these “would-be” favorites that scored 5 stars when I made them, but haven’t yet made a second appearance on my table. Speculoos: These were the perfect rolled cookie. I loved the idea of pre-rolling the dough and then cutting them after the dough is cold. This approach is so much easier than chilling the dough and then trying to roll out cold dough. I’m still not sure why I didn’t make these a second time. When I made the slice-and-bake speculoos in Baking Chez Moi, I decided that I preferred the rolled out version. Orange-Almond Tart: The frangipane filling makes this tart special. I even think this is good without the fruit. And Dorie’s Sweet Tart Dough is something I made all the time. Creamy Mushrooms and Eggs: The mushroom sauce is amazing. Served over scrambled eggs makes a fabulous light dinner (or breakfast). Socca: Chickpea Pancakes, panfried in the oven. I loved the crispy edges and playing around with toppings. When going through the book, a few recipes jumped out at me because I really didn’t like them. With my positive experience with French Fridays with Dorie, I don’t want to dwell on the negative, but because not every recipe in AMFT was “to die for”, I thought I’d share my least favorite recipes as well. I guess these are equivalent to my version of salmon in a jar. Coconut Friands: I don’t eat shredded coconut, making this a challenge. In fact, I didn’t actually make these. I convinced my sister Jane, who does eat shredded coconut, to make these and do a guest post. A win-win situation! Nutella Tartine: This was a tough sell for someone who doesn’t like PB&J. I like peanut butter, but never on bread, and I like jelly, but not together. I did try this, but it really wasn’t for me. Ispahan Loaf Cake: This was just too flowery and too pink for me. I liked this little trip down memory lane. I’ve added favorites to my standard repertoire, and in putting together this post, I’m reminded of recipes I need to revisit. I’m looking forward to finding out what my Dorista friends’ favorites are. Each person is sure to have a different set of choices, so it will be fun to remember the recipes they choose. To see what they picked, check out their links here. All of the recipes can be found in Dorie Greenspan’s book Around My French Table. It’s time for another month with the Cottage Cooking Club, a project led by Andrea, The Kitchen Lioness. Andrea’s merry band of bloggers are collectively cooking all the recipes in Hugh Fearnley-Whittingstall’s cookbook, River Cottage Veg, an inspiring vegetarian cookbook with a wide variety of recipes to suit many different tastes. I was a bit of light-weight for the Cottage Cooking Club this month. It was by design, so I’m not apologizing. I’m just setting expectations properly. May has been a busy month of travel and surprise birthday parties and visiting with family and friends. It was all good, even great. May hasn’t been a month of much in the way of home cooking. Mostly meals eaten out or at someone else’s house. I’m not complaining. Sometimes that’s a welcome change. The one recipe I set my sights on from River Cottage Veg was the Herby, peanutty, noodly salad from the “Hearty Salads” chapter. This simple noodle dish made with super-thin rice noodles and tossed with a multitude of green ingredients is served at room temperature. When I made it, the hot weather hadn’t descended but now that we’ve had a string of days in the high 80s, this would be a perfect dish to revisit. Rice vermicelli is a no-cook noodle. Directions on the package indicated a soak in boiling hot water that’s poured over the dry noodles. Amazingly, you have soft pliable noodles ten minutes later. The noodles are tossed with a bright and zesty dressing with an Asian flair. 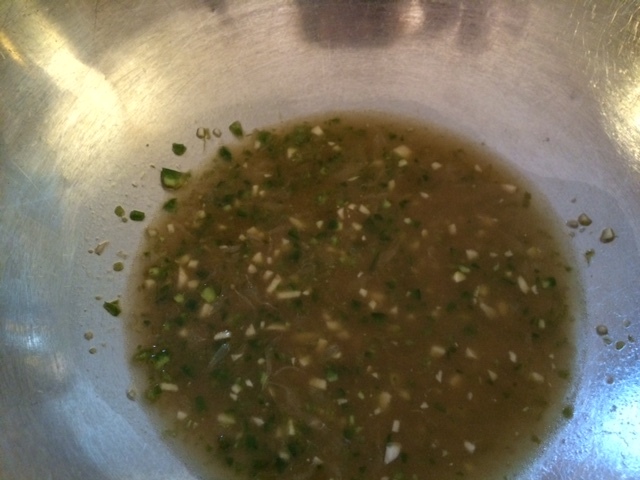 Lime zest, finely chopped hot pepper, and some garlic gave it some zing. 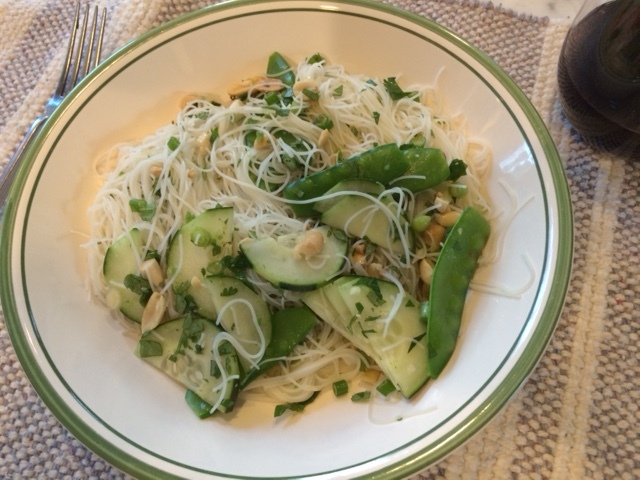 The noodles are topped with roasted peanuts, sliced cucumber, scallions, snow peas and green herbs. I used cilantro along with fresh mint from my herb garden. I didn’t have fresh basil so left it out. There was so much flavor in the toppings, it wasn’t missed. The mix of chewy noodles, crunchy vegetables and verdant flavorful herbs really hit the spot. I will remember this one for sultry hot summer evenings for a light dinner requiring a minimum of actual cooking. My only complaint with the recipe is that the dressing didn’t make nearly enough for my taste. The noodles, while tasty, were a little bit dry. We had some leftovers, so I made a second batch of dressing and added that which did the trick. When I make this the next time, I will triple, or maybe even quadruple, the dressing and add more. I invite you to check out the other recipes that the Cottage Cooking Club sampled this month. You can check out their reviews here.